Here’s a smokin’ speedy pie with just four-five amazing ingredients! It’s smokin’ delicious too! Boil penne for 5 minutes, drain and drizzle with melted butter. Toss well. In a bowl mix beaten eggs and all cheese. Add pasta and toss again. Preheat oven at 180C/fan. 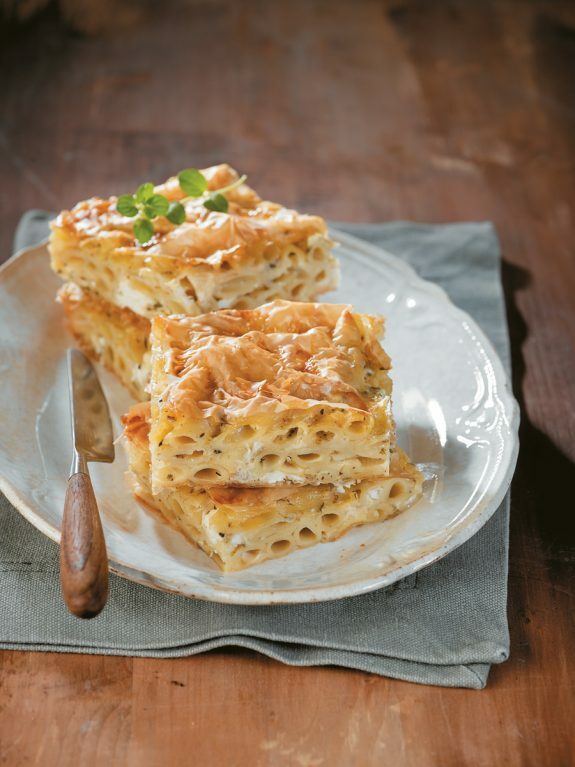 Brush a rectangle medium non-stick baking pan with oil and line the first phyllo sheet, allowing the edges to overhang. Brush with oil and line the second phyllo sheet crinkling it. Repeat with the third sheet. Spread half penne mixture and then cover with 2 phyllo sheets, brushing with oil and crinkling them. Spread remaining pasta mixture and cover with one phyllo sheet, brushing with oil and crinkling it to fit in the pan. Bring the overhanging edges in, brush with oil and cover with the last oiled sheet. Bring its edges under the pie. Sprinkle with a little water. Score the pie in square pieces, pour over egg and milk mixture and bake for 40 minutes until nicely colored. If it starts getting golden color quickly, cover with foil halfway.